The Southern Transvaal Ndebele occupied the river valley, which was to become the location of the city of Pretoria, by around 1600. During the difaqane in Natal, another band of refugees arrived in this area under the leadership of Mzilikazi. However, they were forced to abandon their villages in their flight from a regiment of Zulu raiders in 1832. The first “Boer” homestead in the Pretoria area was probably the home of J.G.S. Bronkhorst, who settled in the Fountains Valley in 1840. More Boer families put down roots around the nearby Elandspoort settlement. In 1854, two years after the Sand River Convention conferred formal independence on the territory north of the Vaal River, the residents of Elandspoort had the village proclaimed the ‘kerkplaas’ for central Transvaal. This made it the focal point for communions, baptisms and weddings. Pretoria itself was founded in 1855 by Marthinus Pretorius, a leader of the Voortrekkers, who named it after his father Andries Pretorius. The elder Pretorius had become a national hero of the Voortrekkers after his victory over the Zulus in the Battle of Blood River. Andries Pretorius also negotiated the Sand River Convention (1852), in which Britain acknowledged the independence of the Transvaal. Pretoria, at it’s founding year, consisted of about 80 houses and 300 residents. Pretoria became the capital of the South African Republic (ZAR) on 1 May 1860. The founding of Pretoria as the capital of the South African Republic can be seen as marking the end of the Boers’ settlement movements of the Great Trek. Commandant-General Marthinus Wessel Pretorius had bought a large amount of land in the area, which was taken over by the government as they foresaw the development of a large centre. The town proper began to take shape in 1856 as a result of Andries du Toit, a presidential advisor, exchanging of one of his Basutho ponies for the entire area known, today, as Arcadia. He spent the next two years surveying his property with pegs and chains. Stephanus Meintjies developed the area and was honoured by having a nearby hillock named Meinjieskop. This resulted in Pretoria extending from Potgieter Street in the west to Prinsloo Street in the east and from Boom Street in the North to Scheiding Street in the South. Not long after its establishment it became known as the ‘city of roses’ because its climate encouraged the growth of rambler roses, which covered gardens and hedges all around the city. In 1888 J.D. Cilliers, a resident ad avid gardener, imported Jacaranda trees from Rio de Janeiro to plant in his Myrtle Grove garden. These trees flourished and as a result the city is now aptly known as the ‘Jacaranda City’, with about 50 000 Jacarandas lining its streets. The British annexed the Transvaal in April 1877, which resulted in a steady flow of immigrants and migrants. During the Transvaal War of Independence the British withdrew and Paul Kruger took over. The Boer Republics of the ZAR and the Orange Free State were united with the Cape Colony and Natal Colony in 1910 to become the Union of South Africa. 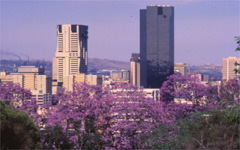 Pretoria then became the administrative capital of the whole of South Africa, with Cape Town the legislative capital. Between 1860 and 1994, the city was also the capital of the province of Transvaal, superseding Potchefstroom in that role. On 14 October 1931, Pretoria achieved official city status. When South Africa became a republic in 1961, Pretoria remained its administrative capital. After the creation of new municipal structures across South Africa in 2000, the name Tshwane was adopted for the Metropolitan Municipality that includes Pretoria and surrounding towns. Pretoria previously had a rather sinister image as “the capital of Apartheid South Africa”. 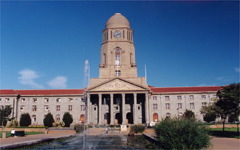 However, Pretoria’s political reputation was changed with the inauguration of Nelson Mandela as the country’s first black President at the Union Buildings in the same city. In 1994 Peter Holmes Maluleka was elected as transitional mayor of Pretoria, until the first democratic election held later that year, making him the first black mayor of this capital of South Africa. Maluleka later became the chairman of the Greater Pretoria Metropolitan City Council (later Tshwane Metro Council), then was elected Speaker of the Tshwane Metro Council and in 2004 was chosen to be a member of the South African Parliament for the Soshanguve constituency. Church Square has always been the hub of Pretoria, although it was initially called Market Square. This was where the first church, a mud-walled building, was built. It burnt down in 1882 and was replaced by a much grander structure. Open markets were regularly held in the Square and Albert Broderick, an Englishman christened Albertus Broodryk, by his Afrikaans friends and customers established himself as shopkeeper. He also ran the community’s first bar, the ‘Hole-in-the-Wall’. When Mr. Sammy Marks, a well-known Jewish industrialist and close friend of President Paul Kruger, was allowed to build the town’s first synagogue he expressed his pleasure by commissioning the sculptor Anton van Wouw to produce a statue of the president. A plinth was erected in Church Square to receive the bronze figure that had been cast in Rome. Unfortunately the South African War broke out and the statue was held up in the then Lorenzo Marques. This resulted in the statue only being erected in 1854, after several changes of site. Church Square was redesigned as a tramway in 1910, much to the disappointment of many of Pretoria’s residents who had tried to convince the civic authorities to create a gracious area of fountains, gardens and Continental-style paving in order to showcase Pretoria as a city. During the rule of the old dispensation Pretoria was the Administrative capital of South Africa. The modern city has many features that retain a position of importance in, especially, the white history of the country. These include the Union Buildings, designed by Sir Herbert Baker, which still houses government establishments; the old Raadsaal (council chamber) of the Zuid-Afrikaansche Republiek on Church Square and the house where President Paul Kruger lived until his exile in 1900. Outside the city towers the Voortrekker Monument and the two massive forts, Klapperkop and Schanskop, built by the Boers to protect their capital against the British. Here you can also find the large and imposing buildings of the University of South Africa (UNISA). Johannesburg also known as Jozi, Joburg, Jolburg, Joni, e-Goli orJoeys, abbreviated as JHB, is, by population, the largest city in South Africa. Johannesburg is the provincial capital ofGauteng, the wealthiest province in South Africa, having the largest economy of any metropolitan region in Sub-Saharan Africa. The city is one of the 50 largest urban agglomerations in the world, and is also the world’s largest city not situated on a river, lake, or coastline. While Johannesburg is not one of South Africa’s three capital cities, it is the seat of the Constitutional Court, which has the final word on interpretation of South Africa’s constitution, and is the provincial capital of Gauteng. The city is the source of a large-scale gold and diamond trade, due to its location on the mineral-rich Witwatersrand range of hills. According to the 2007 Community Survey, the population of the city of Johannesburg was 4,434,827 and the population of the Greater Johannesburg Metropolitan Area was 7,151,447. A broader definition of the Johannesburg metropolitan area, including Ekurhuleni, the West Rand, Soweto and Lenasia, has a population of 10,267,700. The municipal city’s land area of 1,645 km2 (635 sq mi) is very large when compared with that of other cities, resulting in a moderate population density of 2,364/km2 (6,120/sq mi). Johannesburg includes Soweto, which was a separate city from the late 1970s until the 1990s. Originally an acronym for “SOuth-WEstern TOwnships”, Soweto originated as a collection of settlements on the outskirts of Johannesburg populated mostly by native African workers in the gold-mining industry. In 1985 Mr. Nigel Mandy (BA Law – CA), who was the first General Manager of the Carlton Centre, published a book called “A City Divided” – meaning Soweto and Johannesburg cities were divided from a fiscal point of view, were divided by law and people – he also assisted the Provincial Government of the old Transvaal as well as post 1994, in developing a process whereby Black, Coloured, Indian and White people could become homeowners previously deprived from ownership during the apartheid era. (Ronnie Stevens – Gauteng Human Settlements – 2014) Eventually incorporated into Johannesburg, the apartheidgovernment (in power 1948–1994) separated Soweto from the rest of Johannesburg to make it an entirely black-residents area. The area called Lenasia has always been part of the City of Johannesburg. Lenasia is predominantly populated by those of English-speaking Indian ethnicity.